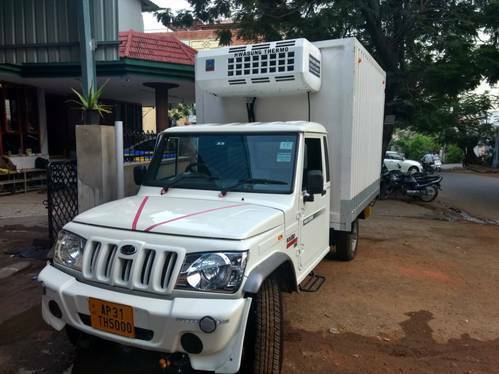 We at vajraa being key player in frozen food industry in andhra pradesh has been planning to launch our own logistics wing since 2015 but after 2 years we have finalized on our vision and finalized on secondary transport & 3 pl services ( we have a large warehouse in visakhpatnam with capacity of 350 mt @ -25 c ). We currently have refer units capable of +25 c to -25 c . So we will be able to catter any kind of temperature controlled warehousing and transportation service . MMG Prasad, founder of the Vajraa Group has rich experience of almost two decades in the field of Frozen Food Distribution and Hospitality. The initiative of a new and a larger dimension combined with operational experience resulted in the success of Sri Vaibhava Sai Communications for the distribution of Kwality wall's. With rich experience from his father, Mr. M. Praneeth Chowdary, B.E had now recently took over the operations of the company. showing a exemplary initiative and drive to expand the agro and electrical products like LEDGEN and other LED products operation throughout Andhra Pradesh, he has begun his career. Vajraa have successfully implemented various operational techniques in Agro, Electrical and Jewellery thus leading to client satisfaction, with good quality production and service it is taking forward with strength and their vision. Vajraa is strictly committed to quality and the concept of continuous improvement. We have been adopting various quality improvement principles and techniques to satisfy our estimated customers. Our quality improvement process structure is designed to identify the concerns and needs of our customers, employees and suppliers which enable our team to address them immediately thus ensuring proved services and overall satisfaction. Internal Quality Assessments are done on continuous basis to improvise on effective and qualitative team work. This enabled us to successfully establish and maintain permanent association with Kwality Walls since 2007. On reputation for quality, service and customer satisfaction is built over hard work and we strive to maintain it furtherand expand .